At Fylkingen, the walls are black, the chairs are black and the floor is black. Behind Leila Bordreuil and Zach Rowden the white projection screen is off. Rowden, on double-bass, is looking down and Bordreuil, on cello, has her eyes closed. The atmosphere is contemplative. The last few people are still entering the room, and the music hasn’t started. The person sitting in front of me, bent back, shoulders hunched up, his finger hovering over his screen, not yet touching it, is ready to hit record on a video. But as Leila and Zach begin to scratch out chords with their bows, he very quickly gives up his phone. Almost inaudible first, the sound slowly amplifies. It’s vibrating, whirring in the space’s four walls. There is something about this performance that can’t be captured in a video. In the darkness I am reminded of Jun’ichirō Tanizaki’s essay “In Praise of Shadows”, where it is the absence of light that allows us to observe the moment, in contrast to the white, light aesthetic of Western culture. Even the ceiling, a black and white grid, reminds me of its 1970s cover. Attractive in one a second, then repulsive in the next, the sonic escalation contains a cinematic tension. It forces our brain to create images. Like witnessing an accident I am unable to move, frozen, locked in a conversation with myself. My terror is visceral. This is the soundtrack of a collapsing mind. The Tyshawn Sorey Trio concert challenges me similarly. The sound levels and the long performance bring a physical pain from standing in one spot. My back aches, but the shadow thrown on the wall, of double-bass player Nicholas Dunston, absorbs my attention. Like the play of candlelight on lacquerware that fascinates Tanizaki, the shadow is what anchored me. Leila and Zach, when coming to the end of the show, capture the sudden moment of being thrown back to reality after gazing into the space, in such a way that we are forced to be here now. The above animation of drawings is by Jenny Soep. A single spoken voice starts, within moments followed by a second, then one by one the rest of the ensemble joins in. When Sean McCann’s piece New Music For Ensemble speaks, Fylkingen is filled with a clutter of softly pronounced vowels and consonants that coalesce into something different, something more than just separate voices. There is no coherent narrative, but there are words clearly spoken. I automatically try to piece them together. But instead of a story forming the voices pool into a droning backdrop. When I stop trying to make sense of the words and listen to the voices together as one, my mind calms. Even when the ensemble start playing their instruments or sing, they fall within the same range, parts of the same grounding harmonics. This is perhaps not typical drone music. 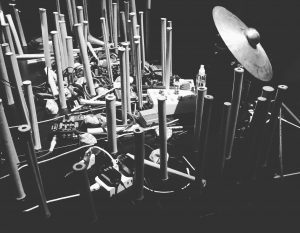 McCann is known as a drone musician for much of his earlier works, but this piece takes the drone further. 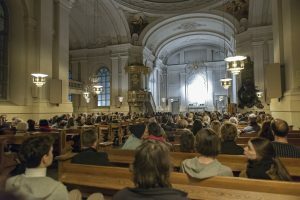 The collaborative performance by Sarah Davachi and Ellen Arkbro is based on music from the 17th century and performed using one of Western music’s most celebrated drones: a large pipe organ reverberating in an even larger stone building, a church. In contrast to McCann, this falls squarely within traditional Western drone music, and instead of words and people we now have pipes and pitch. Humming as air is pushed through them, they create single pitches one by one. Grouped together they form something much grander, losing their individuality and creating a single whole from the multitude: a massive drone. In its simplest definition a drone is a continuous tone, but this is rarely how we use the word when describing music. A drone can be formed of more than just one tone, and for it to work we want it to be fulfilling, we want it to evoke something within us. It must be both simple enough to not impose, but still hold our attention. Quick changes are usually best avoided. Like a hummed ohm, a drone is the bagpipes played by the busker outside your workplace, or even the air conditioner keeping you awake at night. A drone amplifies your sense of being without words. Not all drones are necessarily good for you. In the church of Gustav Adolf, Davachi and Arkbro play sublime music. Faces with eyes closed and tranquil expressions fill the pews. The piece moves, as do my thoughts, although I am hard pressed to remember what those thoughts were. It is an hour-long collective meditation session, the sound from the pipes forming ground for us to ruminate from, or help us empty our minds completely. Towards the end I barely notice Davachi walking up the aisle playing a small accordion. 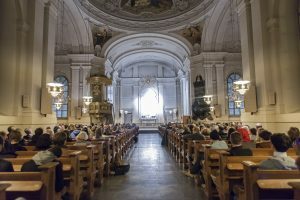 She approaches a smaller organ near the altar, and plays a finale. Drones are played within drones, are played within drones. As the music slowly dissipates through out the vast space of the church the audience awakes, stretching and blinking. The voices of the pipes are gone, and still dazed, we walk silently out into a chilly February evening. As I watched Ahti & Ahti, with their mundane choices of sound objects, I felt a familiar, but increasingly rare, child-like curiosity rise in me. 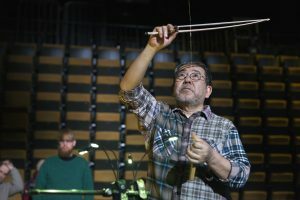 During their 30-minute concert in the dimly lit puppet theatre Pygméteatern in Stockholm, they gently pulled sounds out of a bicycle tube, plate, fork, polystyrene foam and a modular synthesizer. Pointing the open valve of the bicycle tube carefully towards a microphone, the whistling air rushing through it made a ful, low-pitched howling, as the wind on a stormy day. With simple tools and careful choices, Niko-Matti and Marja activated these everyday objects through amplification and processing. 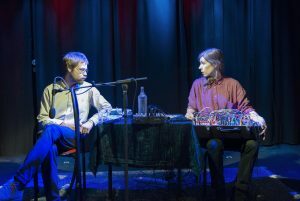 Their music is a slow-moving one, with Niko-Matti carefully deciding what sound to make next, Marja’s black suitcase of synthesizer modules resting on her lap, sampling Niko-Matti as well as utilizing pre-recorded electronic sounds and field recordings as sources for manipulation. Together they take me on an adventure which quickly shifts, depending on whether I have my eyes open or closed. 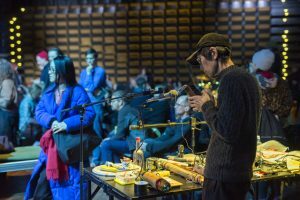 They use the line between the acoustic and the acousmatic, sounds where the source is hidden, as a way of navigating the listeners through their soundscapes. It is impossible for a curious listener not trying to assign the sounds to their sources, and yet I find that the very tactile fork-on-plate screech or rubbing of polystyrene foam becomes surprisingly soothing when I’m not looking. Though recognizable, the sound no longer makes me flinch when it is disassociated with the involuntary scrapes around a dinner table, and furthermore used in combination with electronic tones and drones. As I close my eyes I wonder wether I could guess the object for the sound if I hadn’t seen it — and so my imagination is triggered to create a different narrative in my mind. Ahti & Ahti manage to construct an invented imagined language through their transformation of the familiar into the abstract. In the midst of a sustained, tranquil texture, I suddenly hear footsteps and a person whistling — my focus shifts, giving me the sensation of having super hearing. When Niko-Matti then turns his microphone towards Marja, so that she can blow a low note from an empty glass bottle, I start to wonder wether they are improvising or guiding us through a planned route. It could be both, like taking a walk on familiar grounds, choosing paths as they come up. After carefully picking up leftover bits of polystyrene now dusted on his trousers, Niko-Matti starts to walk slowly around the room, bringing my attention back to here and now. It was through this — the balancing between what is here, and what is somewhere else — that the duo managed to draw auditive narratives that transported me to a parallel reality. Ahti and Ahti’s use of existing places and seamless transitions revealed multiple layers behind the drop curtain of Pygméteatern. In its Latin root, the etymology of translation brings with it the notion of betrayal. Every time a material is transferred, a corruption takes place. With the demand or desire to preserve, a material is affected. To stay true to it, one has to betray it, in one way or the other. I entered Terre Thaemlitz’s piece Deproduction as translator. I was asked to reshape its grammar and its language, but prolong the existence of the body of text. Choreographer Yvonne Rainer once said that the dancer’s body is the “enduring reality” in an ever changing structure of movements. Here Theamlitiz’s meaning becomes the body of the dancer, its movements the grammatical structures, and myself the reader who embodies the unavoidable gap between form and content. Perhaps it is in the betrayal of this gap that the relation between sender and receiver never coagulates, always forming new relations, taking new directions and thus remains. Every relationship contains betrayal, particularly when it comes to experiencing art. Philosopher Jacques Rancière suggests a political practice where one embodies the gap between oneself and society. Perhaps we can transfer his line of thoughts to the engagement in arts? A reader – and spectatorship – needs a void. In arts and music we find the gap between written and read, the uttered and heard, activated by translations between social, acoustic and architectural layers. The speed of the words written by Thaemlitz for Deproduction, which scroll over a projection, gives the sensation of listening, although no words are uttered throughout the whole video performance. Yet, as a listener, one gets the feeling of the words being spoken out loud. The words are organised as screams, whispers and frank statements, and it can be detected that they are written out of a need. The screening is a performance, it activates me as listener. Spectatorship here, is not enough. When entering the room for the screening, I knew the text already. What I did not know was how it was about to be visualised. I found myself in an in-between: between the cinematographic and the sonic, where the question of the enduring – this time human – body, remained in question. My physical presence couldn’t be ignored, just like the body behind Thaemlitz’s text. Perhaps I should say bodies, as the piece included multiple narratives and states, where individual experience was put in a collective context. This lasted throughout images of rapes and orgasms, intertwined with manifestos for another future spectatorship; another embodiment of the void – that is: a new politics. The day after, Sean McCann’s ensemble consists of multiple voices with different agencies: the individual voices form a whole. 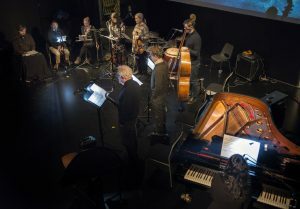 When performing his notes, the members of the ensemble enter into the same landscape of trust and betrayal as I did when translating Thaemlitz, and and as the audience did for his screening. We are affected by the absolute demand for attention. Here, the layers of spectatorships were multiplied, in between each performer. The void previously pointed out between artist and audience, is here found within the ensemble, in their continuous translations of each other actions, through vocals and acoustics, merged together by the electronic distortion of McCann himself. In the large, circular central room of the city library, I find Ranciere’s void in a public space. I go there to listen to The Speaker, a piece on conflict within the social and architectural spaces of the library. With speakers all around the space, various groups of library visitors (some with, some without the intention of attending the performance) embodied the gap which here wasn’t an external part of a readership, or internalised in the ensemble and unreachable for the audience. Here, the gap between publicly shared space and individual relations and sentiments, is in the centre of the piece. Throughout the performance, it is translated by each of us who were present. Pan Daijing performs on the microphone, documenting us on a handheld camera that she carries like a gun. When she points this gun towards the public space, the fourth wall is inverted and corrupted. The lens of the camera becomes her mouth and by recording our spectatorship, we are dragged into its structure, embodying the separation between actor and audience, the logics of performance. The wall falls, leaving us as neither subject, nor object of the performance. Marxist literary scholar Denis Hollier once coined the notion “architectural disturbance”, referring to the way that meanings alternative to the reigning ones are corrupting the common sense. Just like the betrayal of translation, this outspokenness in The Speaker corrupts the social space where only certain ideas and experiences are accepted. The most impressing fact about The Speaker is that the spectator isn’t the one to disturb. Instead, one is part of the architecture under disturbance. This is the gap. When leaving, we take the walls with us. Translation – the betrayal by conscious presence-making – is brought forth by the time passing inside the library, which people still enter for various reasons. The embodiment remains a shared fact and the performance goes on. Later, time is given structure by the droning spheres of Ellen Arkbro and Sarah Darivachi, where all that is left of the Rancièrian gap is a tiny vibration, under the skin of each of us. The drone takes shape when sounding the outcome of embodiment: an attentive participant, including both space and humans, time and memory. 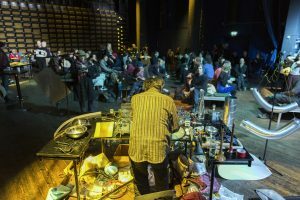 All over the floor of the church, the fragments of previous betrayals are distributed to later be picked up by the ensemble Marginal Consort. They re-read, re-shape and reactivate all the dead shapes of social struggle, putting them again into business. Now, let’s start all over.